Create your own sightseeing itinerary with the Chicago Explorer Pass, saving up to 42% on ticket prices. This multi-attraction pass, valid for 30 days after your first use, provides admission to your choice of up to five attractions, tours or activities at one low price. Make your selections from more than 25 top sites and things to do, including Lincoln Park Zoo, Navy Pier and an Architecture River Cruise. It's the easiest and most affordable way to explore the Windy City at your own pace. Simply download your pass on your mobile device and go – no voucher redemption required! 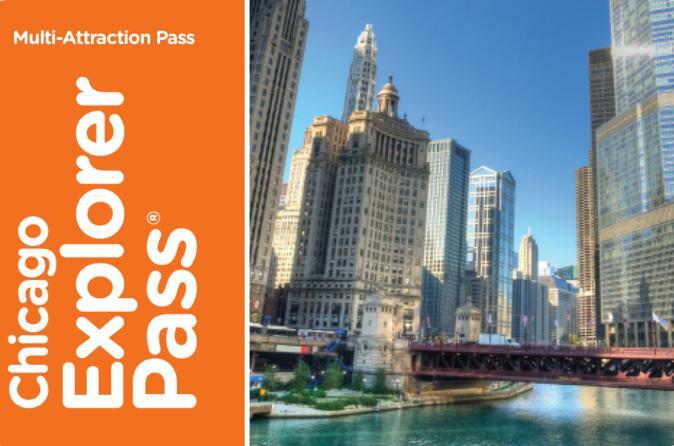 When you pick up your Chicago Explorer Pass, peruse the included guidebook to choose the three or five activities that interest you most from more than 25 museums, tours, cruises and other attractions. The pass also provides discounts at restaurants and retailers around the city. Valid for 30 days from the first day of first use, the pass gives you the flexibility to customize your sightseeing itinerary and discover Chicago highlights at your own pace. The guidebook includes attraction descriptions, hours of operation, directions and maps. Access to your chosen attractions is easy — simply swipe your pass at designated ticketing areas and enjoy! Perhaps you'll visit Adler Planetarium; take a walking tour with the Chicago Architecture Foundation; explore the city with a half-day bike rental at Navy Pier; or check out the Museum of Science and Industry — the choice is yours. See below for a full list, including additional savings.